A premium awning from the experts at Sunesta can turn your underutilized patio in the Glencoe, Minnesota, area, into an outdoor living space you and your loved ones can enjoy throughout the year. All of our beautiful awnings are custom manufactured, so you can be sure that your canopy will perfectly fit the precise dimensions of your unique patio. 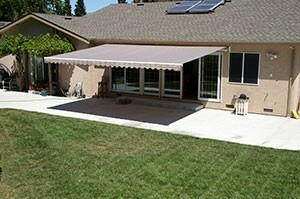 The result is a clean and sophisticated look that cannot be obtained from a one-size-fits-all awning. Plus, your awning will be retractable, meaning you can roll up your patio cover when you feel like lounging in some warm sunshine or getting a dose of Vitamin D.
If you would like to learn more about adding an awning to your patio in the Glencoe, MN, area, call 1-800-SUNESTA today. Our specialists will gladly answer any questions you have.